I had a problem coming up with a name for this salad. Though technically accurate, “Spicy Grapefruit Coleslaw” sounds a little bizarre. Plus, since the grapefruit and the spicy wasabi paste are both optional ingredients, you could make this and come up with a coleslaw that is neither spicy nor grapefruity, but personally I think you’d be missing out on a unique but wonderful taste. 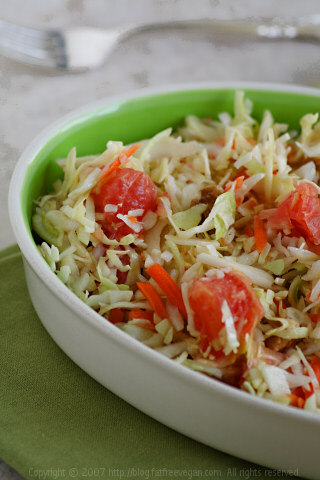 I really love coleslaw, and I’m not a stickler for one type of dressing or another. When I’m in a creamy dressing kind of mood, I’ll make coleslaw with Bryanna’s poppyseed dressing or my mayo-based herb dressing; when I want something lighter, I turn to Asian-inspired vinaigrettes like Sesame-Orange Coleslaw or the coconut-ginger dressing I’ve used on broccoli slaw. 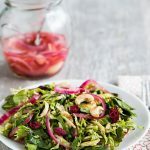 This coleslaw falls into the latter category, but it’s a much simpler version, suitable for tossing together at the last minute for a light lunch. I note that the grapefruit is optional because my husband prefers his without it (he’s not a grapefruit fan). 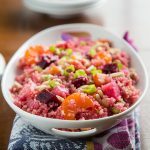 You could also substitute orange or tangerine sections for grapefruit–or use any other fruit that sounds appetizing (I was very close to adding raspberries!) Omit the wasabi if you don’t like the hint of spiciness it gives or just use a little less (or more for you hot-lovers). Put the coleslaw and grapefruit into a mixing bowl. Mix the remaining ingredients in a cup and pour over the coleslaw. Mix well. For best taste, allow to marinate for 15 minutes before serving. I have to admit to eating the entire recipe all by myself! But if you count this as 4 servings, each one, without walnuts, contains 64 Calories (kcal); 1g Total Fat; (18% calories from fat); 2g Protein; 13g Carbohydrate; 0mg Cholesterol; 21mg Sodium; 3g Fiber. With walnuts, it comes out to 87 Calories (kcal); 4g Total Fat; (33% calories from fat); 3g Protein; 13g Carbohydrate; 0mg Cholesterol; 21mg Sodium; 3g Fiber. There is a completely outrageous attack on veganism in today’s New York Times, and though I hate to post a link to it, I think it’s important that vegans see it and let the NYT know how completely devoid of fact that it is. The editorial, by anti-vegetarian propagandist Nina Planck, is here. As a woman who was vegan before, during, and after her pregnancy and who raised an extremely healthy daughter on a vegan diet, I am appalled at the misinformation in this editorial. That it is presented in such a respected newspaper is going to lend credence to a lot of its ridiculous statements. Even if you don’t write a letter, it’s important to know what it says in order to be ready when people challenge your veganism. 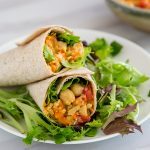 For the (real) facts about children and veganism, check out Jack Norris’ Pregnancy, Infants, and Children and the ADA’s position paper on vegetarian diets. When I get angry, I tend to sputter and swear a lot, so I left it to others to take on the editorial in a more articulate fashion. Here are a few of the many great responses I’ve read to date. Isa jumped in right away on her blog. And people began posting photos of their healthy vegan kids, too! I knew we wouldn’t have to wait long for Dr. John McDougall’s Reply. I have to admit that I mostly stopped reading Tigers and Strawberries after Barbara lauded Nina Planck’s book last year, but she has turned me back into a regular reader with this articulate rebuttal of the NY Times editorial. Too funny… I was eating a grapefruit as I loaded up your blog. Maybe this is a sign, hmmmm. This sounds great, and I’m definitely a hot/wasabi lover. Where do you find wasabi paste? Urus, I get wasabi at a pretty good price, but I have trouble finding horseradish without animal ingredients in it. So I tend to use wasabi even in non-Japanese recipes. Teresa, you can find wasabi paste in a tube at Asian markets, but the cheapest thing to do is look for the cans of powder and prepare your own paste. You just add water until it’s the right thickness, and it’s much less expensive than the tubes. Lasts forever, too! I absolutely love wasabi. I have a can of wasabi powder at home and was going to role more sushi for my wife and I, but now I think I may try this coleslaw. I’m glad to hear that you’re writing to the NY Times–I don’t feel that I can, because I’m not completely vegan yet (I’m making a slow transition, since I’ve had some digestive problems), but since I started transitioning toward a vegan diet, my health has never been better. I thought this article was outrageous as well. Long time reader (not too terribly long…but longer than I read most blogs), first time commenter. I’m not a vegan myself, but I want to eat less animal fats, but get the protein/vitamins, for weight loss and general health. But honestly, I think the child dying (of starvation!! Horrible!) is simply BAD PARENTING!! If you say the literature/resources are out there, then the parents/media have nothing to blame BUT the parents. When you’re pregnant, and living ANY lifestyle, you need to read about how it’s going to affect the baby and how you can affect him/her positively! I see no reason that an infant can’t get the proteins it needs to thrive on a vegan diet. Children, teens, and adults alive have been living well, normal, full tummied lives eating vegan for a long time. It’s ridiculous to blame a vegan lifestyle for something so awful, especially when food-science is creating new foods to fulfill the dietary needs of people. Enough ranting, but I agree that people are pointing the blame at vegans because they don’t want to own up to the real culprit, THE PARENTS!! =D Keep cooking! It is completely ridiculous to label veganism as bad when only a small handful of children have died in the last several years. I agree with Becky – it’s bad parenting, or at least attempted good parenting that went awry. It is terribly reckless to label a diet as dangerous when so many people live healthfully on it (I would include the raw food diet in this as well – my mom has been doing it for two years and she’s totally fine). I feel so much better as a vegan, and I enjoy it. I’d have no problem raising kids on a vegan diet. Thanks for bringing this to our attention Susan! Thanks for the information about the NY Times article. I have emailed them a letter and although I don’t expect it to be printed I think the more letters they get about this the better. To the anonymous reader – I don’t think it matters if you are vegan or not, you can still write to the NY Times to complain about this ridiculous article. I didn’t even mention in my letter that I am vegan. I think your coleslaw looks yummy and I would be with your husband and miss out the grapefruit too…spicy coleslaw sounds good to me! I came by your blog to let you know that I was linking to your Spicy Grapefruit Coleslaw. I had a look at it earlier and liked the sound of it! I come back to have a proper read of your special update and was totally disgusted by the article by Nina Plamck. I may only be a vegetarian and no booker prize winner, but I felt I had to send an email to the NY Times. Here it is! I was disgusted to read this piece by Nina Planck today! It was particularly badly timed because it is National Vegetarian Week here in the UK! It just goes to show that life is truly, one step forward and two steps back! I am truly mystified as to why someone who claims that she is not a scientist and has no personal experience in the matter can write such a damning article. She states “I was once a vegan. But well before I became pregnant..”! Please pass the Vegetarian Society’s website http://www.vegsoc.org on to Ms Plank, she may want to read up on some relevant material before she writes her next rant! She may also like to read a few academic papers ! Thank you for addressing that horrendous article that was printed in The New York Times. It angers me when I read things like that – just like with that news story a few weeks ago, where the headline read something along the lines of, “Vegans starve child to death.” So what are they saying; that if the parents ate meat, then it wouldn’t “matter” if they didn’t feed their child enough?! grr!! sorry for ranting, but I just wish that more people would take the time to research information about veganism instead of passing judgement. thanks again for addressing the issue, and for posting links to helpful resources. As a huge fan of your blog (although not a vegan) I am so grateful to you for posting that article. Even as a non-vegan but a long-time reader of the NY Times, I wrote a letter immediately, and followed the advice of Eric Marcus’ podcast. 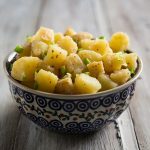 Thank you so much for using your blog not only for fabulous recipes and delightful annecdotes, but also a subtle and inoffensive platform of social change. P.S. I can counting the unspecified minutes until I can buy your cookbook – you have truly turned me from an occasional special occasion cook to a five days a week chef. Now, I am in bed at home after having my wisdom teeth removed, and I so miss making your marvelous recipes! Hopefully, by Friday I can fix my parents your quinoa paella; I bet they won’t even notice it’s vegan, more than low fat! I read that awful Nina Planck article in yesterday’s paper and was really hoping some vegan parents would fight back (I’m a vegan, but not a parent). I’ve seen so many pictures of beautiful, healthy vegan kids — including E, of course! That poor baby died because his parents were criminally stupid, not because they were vegans. Every brand of soy milk I’ve ever purchased has said NOT FOR USE AS INFANT FORMULA right on the box. Feeding a tiny baby plain cow’s milk (not formula) could also have disastrous results. Human babies need human breast milk, and if for some reason breast feeding is impossible, they need a properly constituted formula. I never heard of Nina Planck before, but she sounds like a spokesmodel for the Weston Price Foundation. I couldn’t believe an excellent paper like the Times would print such garbage. P.S. That coleslaw sounds delicious. I love coleslaw. Susan, as usual, your recipes make me drool. I am a big fan of cole slaw, grapefruits, and wasabi, why haven’t I ever combined them before? Oh, and the NY Times piece- words can’t describe my outrage… I’ve already sent in my letter to the editor. I can’t believe in this day and age, vegans are still being attacked on specious grounds such as “complete” proteins, such utterly discredited and out-dated science. As your daughter and many other vegan children can attest (as well as people with much more knowledge of health and nutrition than Planck), veganism is a healthy and beautiful diet for children. I’m glad you posted about the Op-Ed piece (NOT an article) from the Times. My fiance, who is not a vegan, has long voiced his concerns about our conceiving and my nursing children on a vegan diet. He’s worried that it will cause developmental problems and was pouting all evening after having read Ms. Planck’s alarmist warnings. I assured him that her piece was just an opinion (and was thus published in the Op-Ed section) and that I was sure he could expect an educated response to be published in the NYT shortly. No one’s going to sit around in response to her misinformation! The part about the DHA being absent in vegan mother’s breastmilk was so frustrating; fish is not the only source of DHA–fish get it from algae, and we can too! What an outrage! I get so angry and offended when people spout off about vegan diets being dangerous or harmful and not back up their claims with any scientific research. Or what’s worse is when they back their claims with research that was clearly flawed or biased but because they never read the study, they wouldn’t know. This reminds me of an article I recently read in an Arizona paper about a vegan couple who starved their children. The author mentioned in one sentence that the parents were paranoid about obesity and they would time their children’s meals, limit the quantity of food, and make them participate in regular rigorous exercise regiments. The bottom line was that a vegan diet was not what was killing the children. It was the obsessive paranoia of the parents and the quantity of food that the children were given. Unfortunately that issue was glazed over and the majority of the article focused on veganism (probably due to it’s sensationalism). As a matter of fact, the title of the article (which was the cover story) was The Diet From Hell. It made me so upset that they painted veganism in such a bad light. Anyway, I’m writing a letter to the NYT right now. Thanks for sharing this article. On another note, I’ve been catching upon your blog and tried your BBQ ribz. They were so quick and easy I was delighted. Not having much in my pantry after our long vacation, this was a terrific meal I could make with ingredients I had on hand. Some frozen veggies and canned beans rounded it out nicely. Thanks!! Susan, I tried this recipe with oranges rather than grapefruit and LOVED it, as did my sister. I actually made it again for supper last night as a double batch and it is mostly gone. Thanks so much for a light, refreshing recipe. Susan–I am glad to hear that you liked my rebuttal of Planck’s op-ed piece. Thank you for linking to it. I really think that Planck has a problem with stating her opinion as fact; she did this a lot in her book, too, which is one of the things I really disliked about it. I also think that her slamming of the vegan way of eating is complete and utter crap, and I am not sure quite why she is so adamant about it. She promotes real food as food that our grandmothers would recognize–but tofu, soy milk, tempeh, seitan, miso and soy sauce all have thousands of years of history behind them. I am sure that plenty of Chinese (or Japanese) grandmas would recognize all of them as food–and thus, they would fit her definition of real food! So what is her issue? That is what I cannot figure. Oooooh. I was already frustrated today so loathe to open the link, but I couldn’t keep my curiosity at bay. This kind of thing really makes my blood boil. I’m usually mild tempered, but I sent a scathing letter very fast to the NY times. A friend sent the link last week, and I was too mad to do more than skim it. Yesterday I read about a carnivore who beat a four year old to death, obviously as a result of a diet based on torturing animals rather than real food. Right, like you’ll ever read that slant in the NYT. Firstly, thanks for mentioning that Times editorial. As a devout NYT reader (I plan my Wednesdays around when I get to read the “Dining In” section) I was saddened to see such opinion parading as fact. Thanks for calling your readers’ attention to it. It needed an ousting. I liked Isa’s response as well. Secondly – I’ve been DYING to try a grapefruit and wasabi combination… I was thinking over noodles. I’ll link back to this slaw when I’ve made something up. Sounds fab! I am a coleslaw fan so Ill try your versions soon. Sounds like we think alike when it comes to coleslaw. I’ve never met one I didn’t like. I make one with toasted nuts and or seeds that calls for Ramon noodles toasted for garnish and the seasoning packet goes into your vinegarette. This recipe takes on many variation also. Not my original recipe.